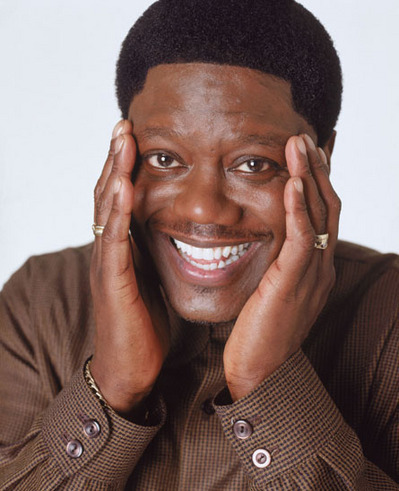 Bernie Mac was undoubtedly one of Chicago's most beloved entertainment figures; from a successful stand-up comedy career to his award-winning, self-titled sitcom to his big screen movies, he rose from local cult status to crossover superstardom. Here, filmmaker Robert Small discusses I Ain't Scared of You: A Tribute to Bernie Mac (premiering on Comedy Central, February 2012), which pays homage to the late comedian and actor's Chicago roots, career and family life, and also tells why his legacy should never be forgotten. Along with some of pop culture's most popular series including "MTV Unplugged," you're behind numerous stand-up comedy specials and documentaries--are you a huge comedy fan? Huge. I've always loved comedy and comedians--I know a lot of them personally. I don't get much to the clubs anymore, but I do follow it online. I did a bunch of shows for the Viacom group and I got involved in comedy about 20 years ago for television. I know a lot of people--I would say 75% of the people anyone knows the name of, I have met and worked with, but Bernie Mac is one I never did meet. I've always been a huge fan of his work and there is something about him essentially that I identify with--I'm not sure how to put my finger on it but it's kind of a soulful, spiritual place. I feel like his upbringing, his attitude toward family, his attitude towards life--the way he talked--I just relate to it. Did you ever try to connect with him before he passed? For years, I was hoping to work with Bernie Mac--I hoped to come across him and either do a special or a film. I had just finished a film on another comedian, Sam Kinison, and then one day, I just got the instinct to look up Bernie's widow, Rhonda McCullough. I gave her a call and I think I called her at a time when she was feeling the same way I was about Bernie, which is that he was away from the scene because he had passed and people weren't talking about him as much. I asked Rhonda if she minded if I did a film about him. How did she react when you asked her about doing a film on Bernie Mac? I guess she had been approached a couple of times and turned it down, but then, she felt for some reason that the time was right. We hit it off and we talked about two or three times. I then told her that I wanted to come to her home, go through pictures and old videotapes and talk about what Bernie was really like--maybe get some of the people he worked with to also talk to us and then I could document his life. When she agreed to that, I met with his daughter Je'Niece at his Chicago home and we spent about four hours talking about him. What did his daughter share with you about her famous father? We had a lot of Bernie Mac interviews that Rhonda made available and when you see the film, you'll see that Bernie kind of talks us through his life--and what he doesn't talk us through, Je'Niece, who's fabulous in the film by the way, does interviews with people and talks about the early days when Bernie took her around to his film shoots and comedy nights. It was really just the juxtaposition of him as a comedian and him as a father that made it work. Then, to hear it from his voice about how he juggled jobs at United Parcel Service (UPS) and Wonder Bread how he tried to make decisions to leave those jobs that had more security and take the shot he needed to take, it just really became a more compelling film. And that's how it all came about. I think it's one of the best things I've ever done. Once filming got underway, what did you envision? I've done a lot of biography-type films and a lot of personality-driven pieces, but I didn't see this one coming until now. I thought it would be more solely about the rise of a comedian out of Chicago--somebody's that's beloved and missed--that I wanted to make sure people didn't forget about so quickly because it's so easy nowadays for something like that to happen. While making the film and hearing his voice when we were editing it, it started to become very personal, especially when he talked about telling his wife that he had to quit his job and do what he thought he was meant to do, which was to be a comedian. "I ain't scared of you" is, of course, one of Bernie Mac's most famous lines--some might even deem it quintessentially him--was that a factor when it came time to choose the title? The name originally was This is the Mac Man, but in the film, we tell the story of how "I ain't scared of you" came about. [Comedian] Bill Bellamy was backstage with Bernie at [HBO's] "Def Comedy Jam" when he coined that phrase. The story goes that when he did "Def Comedy Jam," it was a big night, with Bill telling him how everybody knew that if you did really well, it meant good things were going to happen to you afterwards. The guy that went on before Bernie got booed--and Bill was backstage with Bernie and told him, "Be careful out there--this audience is tough." Bernie replied, "I've been going at this too long--I've worked too hard--I ain't scared of 'em!" That became the whole thing for me for the movie at that point. I remember that line and that episode very well--he indeed made a statement with it. Yes. He went onstage and just said, "I ain't scared of you mother-------!" and the audience went crazy. Rhonda talked about how he didn't even write or plan that--it just came from him. It really showed who he was when he came out and said that and at that point, there was no way to not have called the film, "I Ain't Scared of You." Bernie Mac is often credited with shaping not only Chicago's urban/underground comedy scene, but also the city's comedy scene in general--does the documentary explore this somehow? We talk about him and his roots and passion for Chicago and we also talk about how important the Chicago audience was to him--that's a big part of the film. When Bernie wasn't getting hired, he put his own show together, which is how "Midnight Mac" happened on HBO. For that show, he said, "I'm gonna do it in Chicago." It was ahead of its time but a lot of what Bernie did was ahead of its time. Along with director Steven Soderbergh, the documentary includes some Hollywood heavy hitters who were also his co-stars: Samuel L. Jackson (Soul Men), Chris Rock (Head of State) and Cameron Diaz (Charlie's Angels: Full Throttle), to name a few. Tell us about getting them on board for this project. I called some of the celebrities he worked with and it was really great because I got "Yes I want to be involved in that" from everybody--you don't get that every day. Anybody trying to make a film can reach out to these people--I'm not saying they won't participate--but I've never seen people say "yes" so quickly. Some couldn't make it because of their schedules--I know Spike Lee wanted to do it--and George Clooney and Matt Damon wanted to--but they were in Europe. But we did get a lot of great people who took time out their schedule to sit down with me. It was such a great outpouring of love and respect for him. You already mentioned Bernie Mac's widow, Rhonda McCullough, and his daughter, Je'Niece, the two people who undoubtedly knew him the most intimately, being part of the project. What was it like collaborating with them? I had never really done it that way before, but it seemed if they were willing to do it, those were the people who should tell the story, more than me or anyone else. But Je'Niece is quite a talent; she has a future in the business if she wants it. She's smart, she has a sense of humor, she's pretty and charming--she's got the whole package. What do you think it was about Bernie Mac that made him so revered as an entertainer? I think it's because you knew he loved his family and his city. Even when he was making big movies, he was the same guy; also, the fact that he didn't turn into some "Hollywood darling," remained himself and stayed true to where he was from, people respected him for that. Does the documentary reveal anything you think we'd be surprised to learn about him? I don't think there's anything revealing if you really knew him, but if you only know who he is from a film or a sitcom, I think you'll learn a lot from this. If there was one thing you'd want folks to take away from this documentary, what would it be? If you give someone a chance to show you what they can do, you may be surprised. That's all Bernie ever asked for--a chance to do his thing. And he did just that. See the Chicago red carpet premiere of I Ain't Scared of You: A Tribute to Bernie Mac, Thursday, Jan. 19, at ShowPlace ICON Theater, 150 W. Roosevelt Rd. Showtime is 8pm; general seating opens at 7:30pm, tickets are $35; VIP reception and seating, 6pm-7pm, $125. For more information, call 312-291-4493. Yes. He went onstage and just said, "I ain't terrified of you mother-------!" and the visitors went mad.